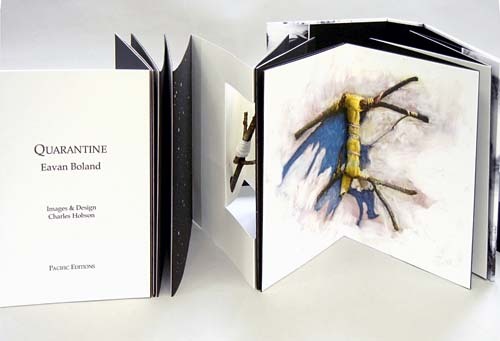 Quarantine has been made as a limited edition accordion book in an edition of forty-two copies in the spring and summer of 2011. Eavan Boland's moving poem is a stark and severe depiction of the deep relationship between a man and a woman that transends the traditions of love poetry. 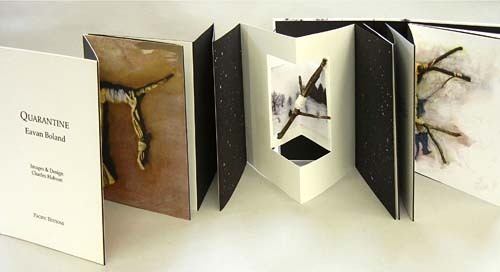 The imagery and design of the book have been inspired by the bleak winter landscape of snow and frozen trees and by the practice of grafting. 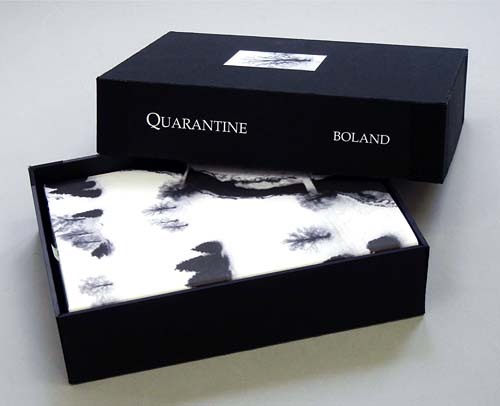 Quarantine has been made as a limited edition accordion book in an edition of forty-two copies in the spring and summer of 2011. A stop action animation about the making of Quarantine has been created as a video on Youtube. See the video. 18 pages. 9 x 6.5 x 2.25 inches. He was walking--they were both walking--north. The genesis of the design of Quarantine was a view from the airplane window on a flight out of Chicago in January 2011. 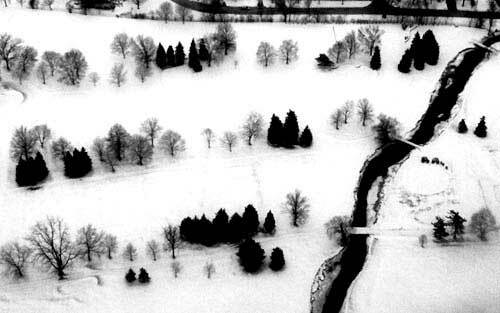 The stark trees and unbroken snow seemed to capture the bleak and desolate landscape called to mind by the poem. Contemplating the scene of trees and snow led to the notion of "grafting"--the practice of joining together the branches of two different species, a notion spawned by the line of the poem in which "her feet were held against his breastbone" so that he could give her the last warmth of his body. 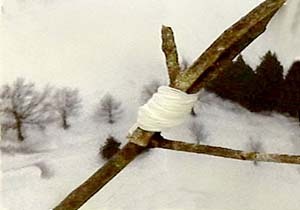 The practice of grafting intersected visually with the shamanic fetishes collected by my wife, Sandra, in her travels related to her study of indigenous wisdom and healing practices. 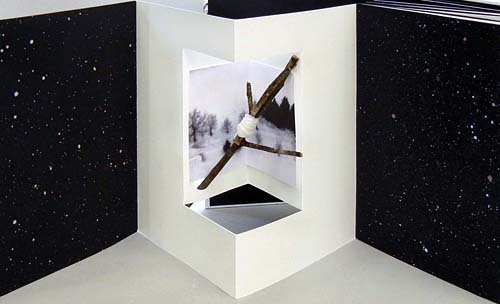 Drawings and monotypes of twigs tied together suggested by this intersection led to the visual images used in the book. The images are monotypes of bundled twigs that have been printed as high-resolution digital prints with additional pastel finishing. The twigs in the centerfold of the accordion are from bay and fir trees in the hills above Stinson Beach, California. The text is 12 point Palatino and has been printed letterpress by JR Press, San Francisco, on BFK Rives. 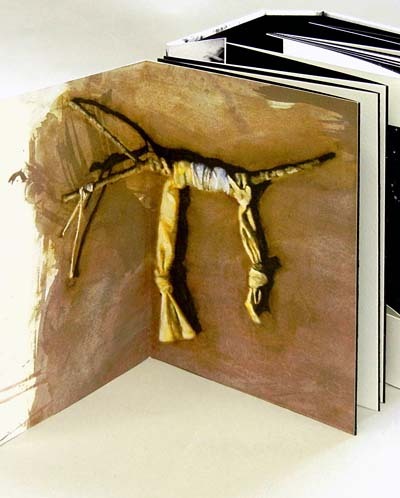 The black pages are Stonehenge and have been hand-painted with acrylic for the two pages at the center of the accordion. Eavan Boland was born in Dublin, Ireland, in 1944. She received her B.A. from Trinity College in 1966. Her first book of poetry was New Territory published in 1967 with Dublin publisher Allen Figgis. This was followed by The War Horse (1975), In Her Own Image (1980) and Night Feed (1982), which established her reputation as a writer on the ordinary lives of women and on the difficulties faced by women poets in a male-dominated literary world. Her collection In a Time of Violence (1994) received a Lannan Award and was shortlisted for the T. S. Eliot Prize. Her volume of poems Against Love Poetry (W. W. Norton 2001) was a New York Times Notable Book of the Year. She has taught widely and since 1996 she has been a tenured Professor of English at Stanford University where she is Director of the Creative Writing program. She divides her time between Palo Alto and her home in Dublin.